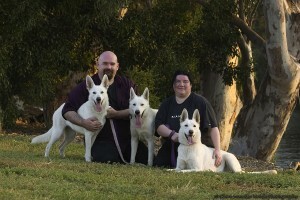 Welcome to Fanuilos White Shepherds, breeders of quality White Shepherd Dogs in Melbourne, Australia. Hopefully this site will provide information about the beautiful white shepherd dog and our kennel’s goals with the white shepherd breed. The goal of Fanuilos White Shepherds is to breed healthy, sound white shepherd dogs with excellent temperaments to become a treasured part of your life, whether they are used for working, dog sports or companionship. Our breeding program has been acknowledged as being the most extensive of any breeder in the country; where full disclosure of health testing is available and an excellent understanding of the diseases in the breeds bloodlines and what we have done to mitigate these risks to our puppies. As the demand for a Fanuilos puppy is greater than our rate of litters; we also are willing to help finding you a good puppy if we do not have one available in the timeframe you intended and are more thn willing to assist in explaining the details on what those hip/elbow scores mean, and why testing for MDR1 mutation is very important. Fanuilos White Shepherds also provides a foster home for White Shepherd rescue dogs until suitable forever homes can be found, please see our rescue and rehoming section if you would like to help.